(Nanowerk News) Advances in 3-D printing have led to new ways to make bone and some other relatively simple body parts that can be implanted in patients. But finding an ideal bio-ink has stalled progress toward printing more complex tissues with versatile functions -- tissues that can be loaded with pharmaceuticals, for example. 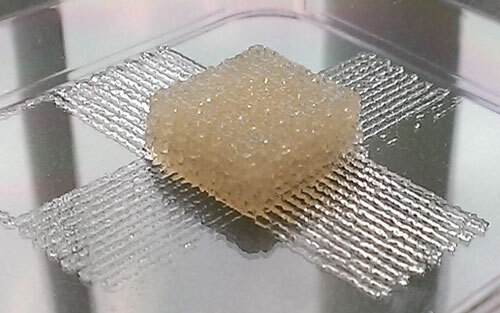 Now scientists, reporting in the journal ACS Biomaterials Science & Engineering ("Polyol-Silk Bioink Formulations as Two-Part Room-Temperature Curable Materials for 3D Printing"), have developed a silk-based ink that could open up new possibilities toward that goal. Scientists have developed a silk-based, 3-D printer ink for use in biomedical implants or tissue engineering. Most inks currently being developed for 3-D printing are made of thermoplastics, silicones, collagen and gelatin or alginate. But there are limits to how these inks can be used. For example, the temperatures, pH changes and crosslinking methods that may be required to toughen some of these materials can damage cells or other biological components that researchers would want to add to the inks. Additives, such as cytokines and antibiotics, are useful for directing stem cell functions and controlling infections, respectively. To address these bio-ink limitations, David L. Kaplan and colleagues turned to silk protein and developed a way to avoid these harsh processing conditions. The researchers combined silk proteins, which are biocompatible, and glycerol, a non-toxic sugar alcohol commonly found in food and pharmaceutical products. The resulting ink was clear, flexible, stable in water, and didn't require any processing methods, such as high temperatures, that would limit its versatility. The researchers say the novel material could potentially be used in biomedical implants and tissue engineering.